Algebras of distributions of binary isolating formulas over a type for quite o-minimal theories with nonmaximal number of countable models are described. 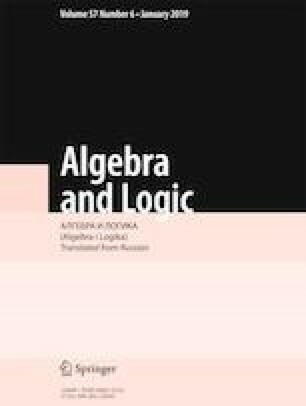 It is proved that an isomorphism of these algebras for two 1-types is characterized by the coincidence of convexity ranks and also by simultaneous satisfaction of isolation, quasirationality, or irrationality of those types. It is shown that for quite o-minimal theories with nonmaximum many countable models, every algebra of distributions of binary isolating formulas over a pair of nonweakly orthogonal types is a generalized commutative monoid. Supported by RFBR (project No. 17-01-00531-a), by KN MON RK (project No. AP05132546), and by SB RAS Fundamental Research Program I.1.1 (project No. 0314-2019-0002). Translated from Algebra i Logika, Vol. 57, No. 6, pp. 662-683, November-December, 2018.